stuffed? too lazy to reach that last slice of pizza? not a problem. 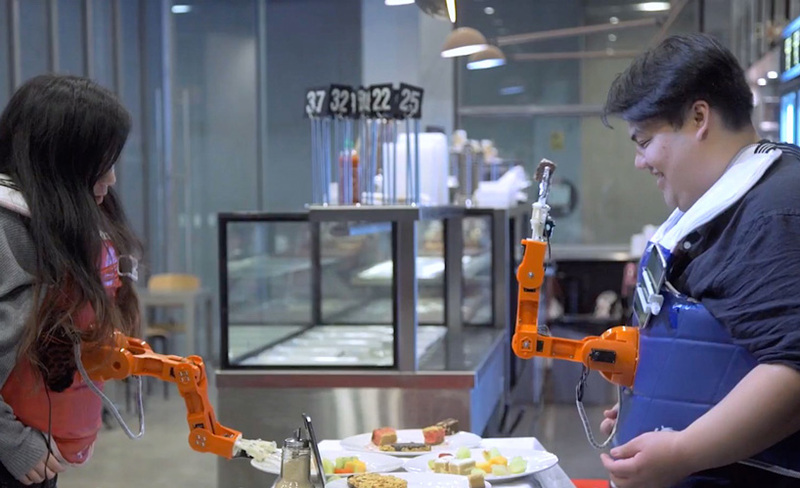 researchers from the exertion games lab at RMIT university in australia have invented ‘arm-a-dine’, a robot arm worn in the middle of the chest that picks food up and feeds it to you and your dinner guests. the point is to subvert the functioning of the robotic arm so that its final movements (once it has picked up the food), i.e. whether to feed the wearer or the partner, are guided by the facial expressions of the dining partner. the device uses a facial recognition app running on an attached smartphone which scans your dining partner’s expression. if they’re smiling, your arm offers them the food; if they’re frowning, you get it. arm-a-dine is a prototype designed to augment the social experience of eating, using technology to transform the eating of food rather than just the preparation. this has been successful according to a paper published by the lab, although with somewhat odd responses. testers said using arm-a-dine made them nostalgic: ‘it reminded me of my mother feeding me when I was a child’, and encouraged them to concentrate on eating ‘I had to focus […] in order to pick it up [food] properly’. one tester was even excited by the apparent ‘teasing’ of the third arm as it fluttered between mouths. it makes you wonder how our experience of eating has evolved over the years. ‘arm-a-dine: towards understanding the design of playful embodied eating experiences‘ was presented at chi play 2018 where its creators, yash dhanpal mehta, rohit ashok khot, rakesh patibanda, and floyd mueller. arm-a-dine is not a commercial project but rather a device used to interrogate social rituals. whilst it would have been handy to get through the gluttony of thanksgiving there are currently no plans to market the device – maybe next year!